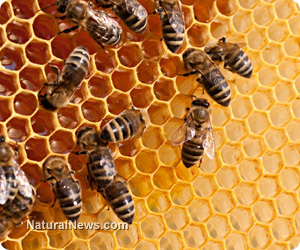 (NaturalNews) A major victory for the world's bee populations has been achieved in Europe, where a majority of European Union (EU) member states voted recently to ban the use of bee-harming neonicotinoid pesticides across the entire continent for at least two years. In an overwhelming vote of 15 to 8, these member states decided that, based on a plethora of scientific evidence, the use of thiamethoxam, clothianidin, and imidacloprid on crops is destroying bee populations, and thus must end. The decision comes after months of deliberation over the safety of neonicotinoids, which have repeatedly been shown to be a significant, if not the primary, factor causing the global phenomenon of Colony Collapse Disorder (CCD). CCD is characterized by worker bees leaving to forage and never returning, or simply dropping dead in large groups for no apparent reason. Another common characteristic of CCD is excess deaths among queen bees, which acts as a type of mother to the rest of the bees. As we reported recently, the European Food Safety Commission (EFSA) determined back in January that neonicotinoid pesticides pose an "unacceptable" risk to bees, concluding that the scientific evidence currently on the books does not point to these pervasive chemicals being at all safe for bees. This, combined with several other studies published in 2012 that revealed neonicotinoids to be a major cause of insect loss and habitat decline, are what prompted a cohort of EU member states not dominated by chemical industry interests to outlaw the poisons. "This decision is a significant victory for common sense and our beleaguered bee populations," stated Andrew Pendleton, Head of Campaigns for the environmental advocacy group Friends of the Earth (FoE), to The Guardian. "Restricting the use of these pesticides could be an historic milestone on the road to recovery for these crucial pollinators." Prior approval for neonicotinoids was based on flawed studies that failed to evaluate the effects the chemicals have on wild bee populations, which are said to comprise 90 percent of the pollinators that frequent flowering food crops. These same studies also failed to consider the long-term effects of the pesticides, as well as their synergistic effects when used in combination with each other, which is what actually happens in real life. "The ban is excellent news for pollinators," says Professor Simon Potts, a bee expert at the University of Reading, as quoted by The Guardian. "The weight of evidence from researchers clearly points to the need to have a phased ban of neonicotinoids. There are several alternatives to using neonicotinoids and farmers will benefit from healthy pollinator populations as they provide substantial economic benefits to crop pollination." As far as those countries that voted against the ban, many watchdog groups and others are hoping their corruption will be exposed far and wide. The U.K., for instance, which abstained in an earlier vote on the matter, changed its vote at the last minute in support of continuing the neonicotinoid-driven bee holocaust. "By not supporting the ban, environmental secretary Owen Paterson has exposed the U.K. government as being in the pocket of big chemical companies and the industrial farming lobby," Doug Parr, Chief Scientists at Greenpeace, is quoted as saying. MP Joan Walley, who chairs the U.K.'s parliamentary green watchdog, is also calling for a "full Commons debate" to hold all the voting ministers accountable. Other EU countries that voted against the ban include the Czech Republic, Italy, Hungary, Romania, Slovakia, Austria and Portugal. Ireland, Lithuania, Finland and Greece abstained in the vote. And those brave countries that voted to protect bees by banning neonicotinoid pesticides include Belgium, Bulgaria, Denmark, Estonia, Spain, France, Cyprus, Germany, Latvia, Luxembourg, Malta, the Netherlands, Poland, Slovenia and Sweden.